These are the original writings on the back of St. Patrick's Day cards, with some dating as far back as 1908. We have tried to descipher the writing as correctly as possible. "I mailed you gloves today but they look too large so I am afraid I got wrong size. If I did I can return them after Easter. Happy returns of the day. Biss"
10. 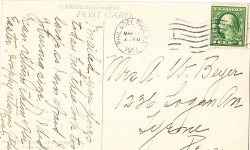 FRANKED: 16 MARCH 1915 ~ LAKEWOOD, N.J.
"Hope to see you soon and hope you are well. We are having fine weather here. (But in hand writing on the card the date March 17 1913 can be seen). "Received your letter. Will write later. "We all join with Nick in sending greetings to his friends in Plessis"
"I received your postal but I don't consider that writing. I thought you meant you would write a letter.